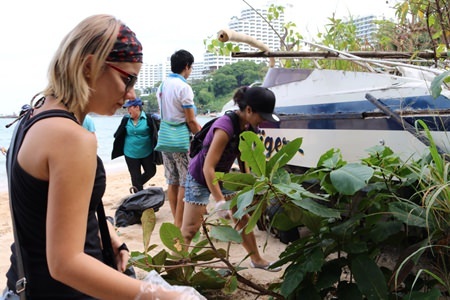 It has been a very busy month for Green Pattaya, with two cleanings, for on Saturday 23rd November Green Pattaya again took on the challenge to clean the Cosy Beach area. 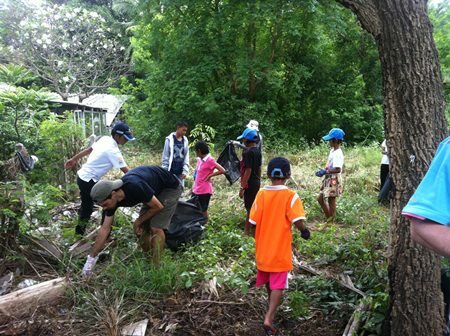 The cleaning started at 09.00 with a group comprising Green Pattaya volunteers, 40 children and supervisors from the Human Help Network Foundation and members of the Rotary Club Eastern Seaboard cleaning the area around Pattaya Hill Condo Resort. After an hour, the Pattaya Hill Condo Resort offered refreshments and it was time to head down to Cosy Beach. 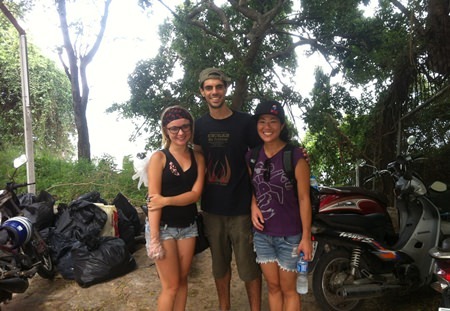 (L to R) Volunteers from Russia: Veronica, Leandro and Anita from Argentina. You can not beat the effectiveness of 40 enthusiastic children cleaning and after just two hours the beach and the area around the Cosy Beach Hotel was spotless. Green Pattaya, HHNF and Kingdom Properties offered refreshments to everybody and it was time for the children to go get a well deserved meal sponsored by the Pattaya Hill Condo Resort. The Cosy Area now has a new water drainage pump installed after an initiative by Green Pattaya made City Hall aware of the problems resulting from the old one breaking down. Still, the area has four dilapidated boats occupying a large area of the beach; Green Pattaya has again urged City Hall to action on this matter since the boats for the moment are just used as flower pots. The area has four dilapidated boats just being used as “flower pots”. This 10th event was again supported by the Human Help Network Foundation who donated 10,000 THB to Green Pattaya for their educational and environmental projects. Water was provide by Kingdown Properties and First Aid standby from Bangkok Hospital Pattaya. Children from Human Help Network Foundation cleaning up outside Cosy Beach Hotel.